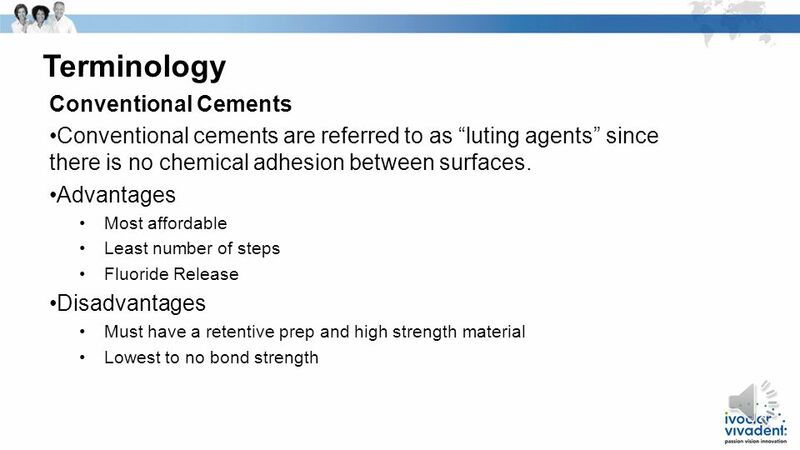 3 Terminology The terms cementing, luting and bonding are used interchangeably within the industry. 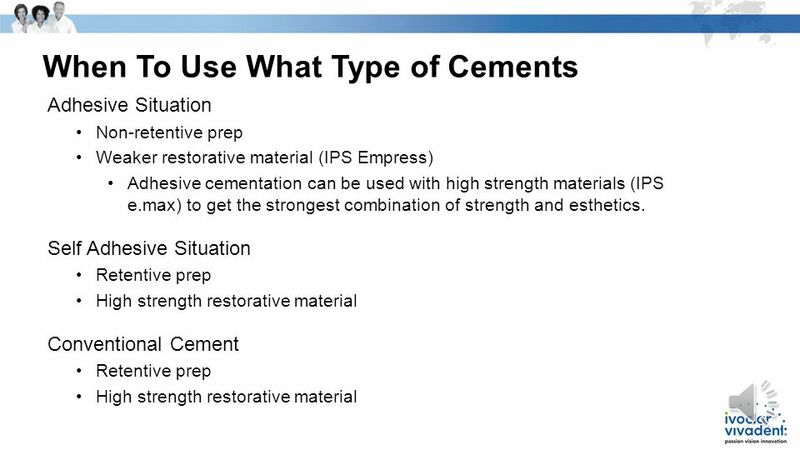 Cementing is a generic term for joining two materials together. 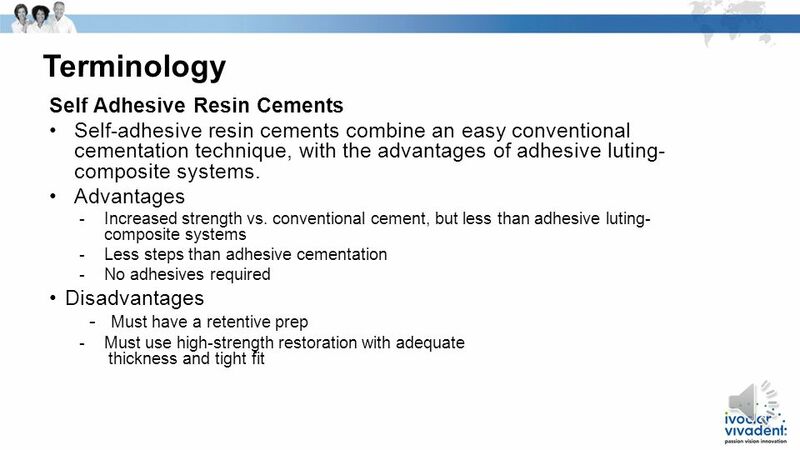 Luting means no adhesive interaction between the surfaces. 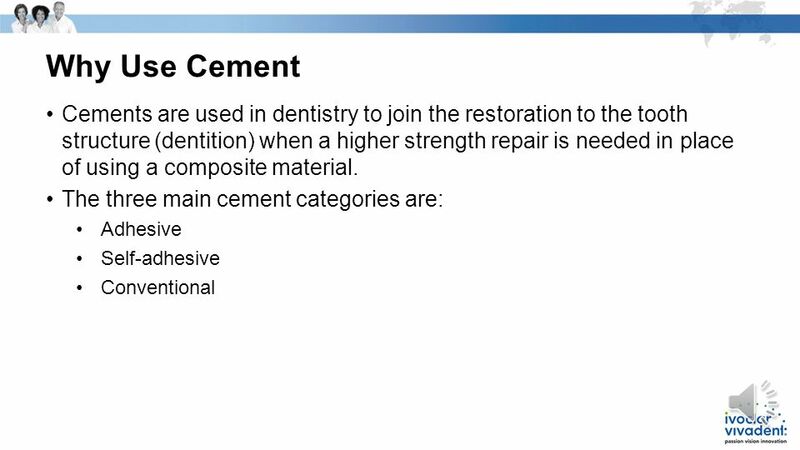 The retentive form of the tooth (prep) and the crown allow the materials to “interlock” together using the cement as a filler between the two. 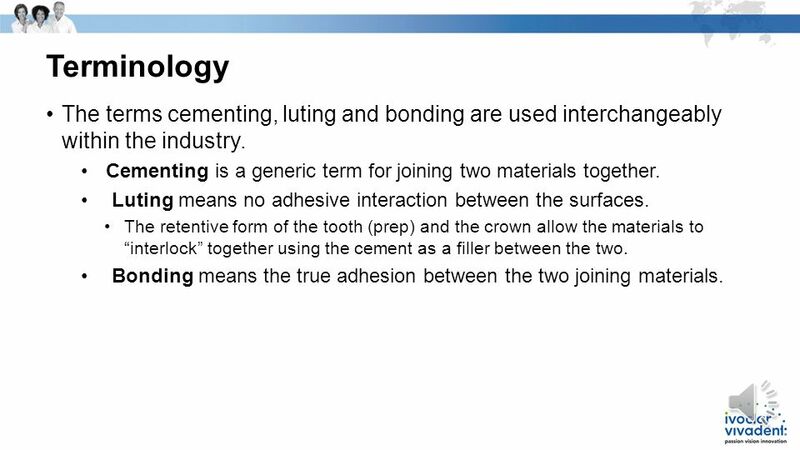 Bonding means the true adhesion between the two joining materials. 4 Terminology Retentive – the ability to hold two things firmly together when they will not adhere (stick) to each other. 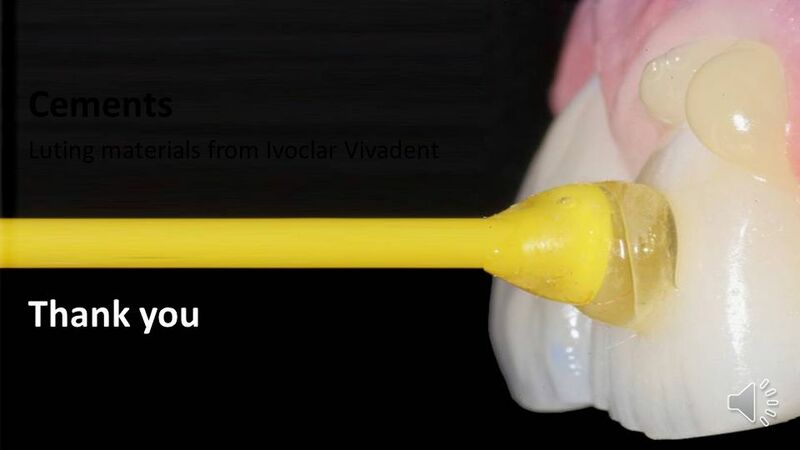 Retentive Prep Preparation with parallel walls (taper less than 10) and minimum height (4 mm). 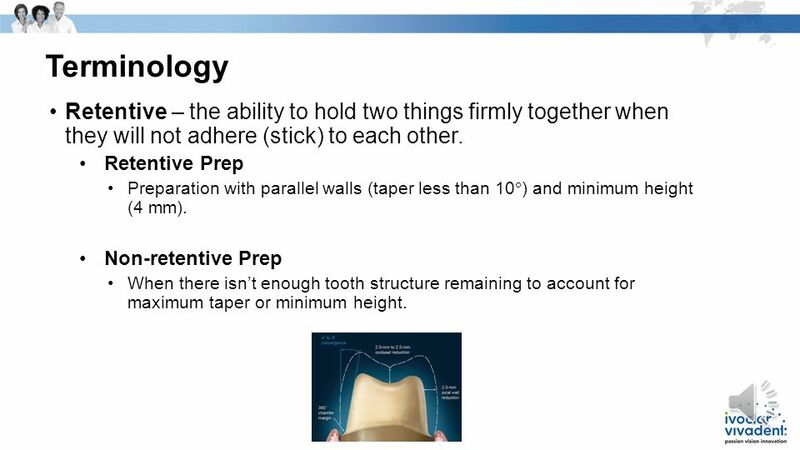 Non-retentive Prep When there isn’t enough tooth structure remaining to account for maximum taper or minimum height. 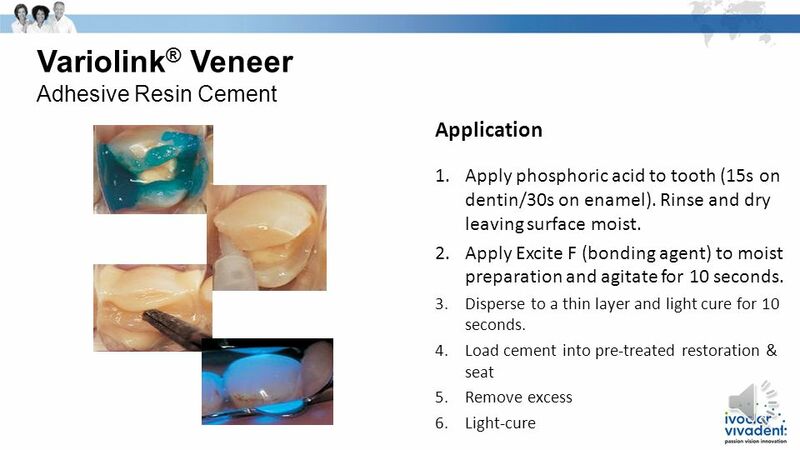 The cement must be polymerized with a curing light Self Cure with Optional Light Cure The cement can be left to polymerize on its own without a curing light or polymerization can be expedited by using a curing light. 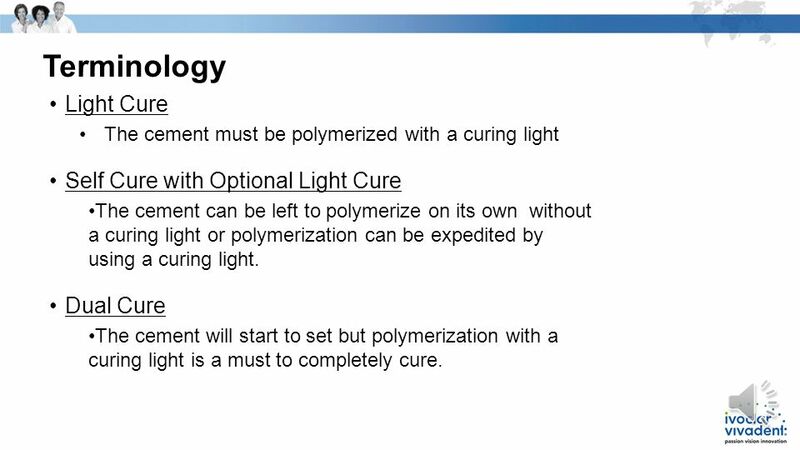 Dual Cure The cement will start to set but polymerization with a curing light is a must to completely cure. 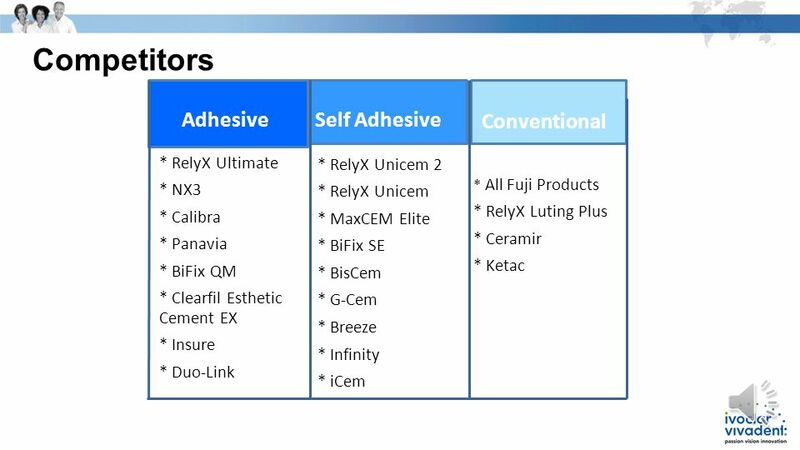 * NX3 * Calibra * Panavia * BiFix QM * Clearfil Esthetic Cement EX * Insure * Duo-Link * RelyX Unicem 2 * RelyX Unicem * MaxCEM Elite * BiFix SE * BisCem * G-Cem * Breeze * Infinity * iCem * All Fuji Products * RelyX Luting Plus * Ceramir * Ketac Adhesive Self Adhesive Conventional The largest competitor to Ivoclar Vivadent cements is 3M’s RelyX Ultimate (Multilink Automix), 3M RelyX Unicem 2 (Multilink Automix and SpeedCEM) and Kerr’s NX3 (Multilink Automix). 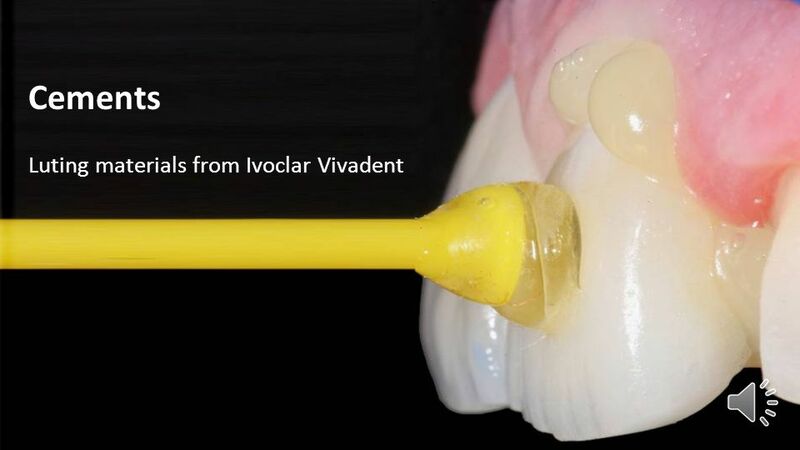 14 Ivoclean Universal cleaning paste effectively cleans the bonding surfaces of prosthetic restorations after intraoral try-in. 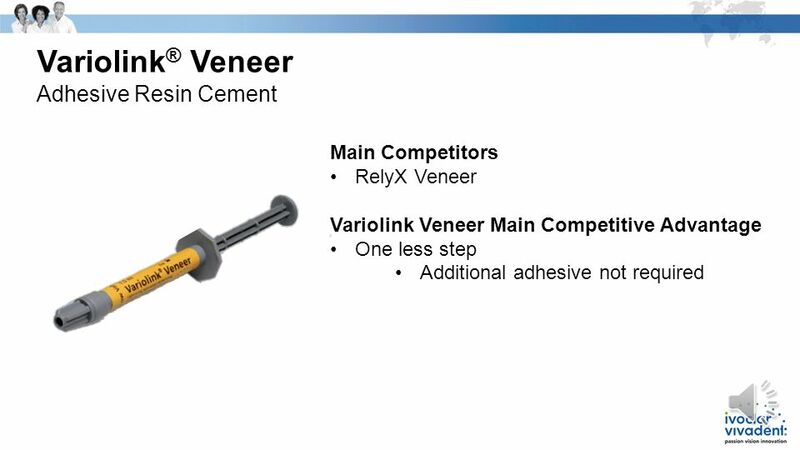 Creates optimum pre-requisites for the adhesive luting procedure. 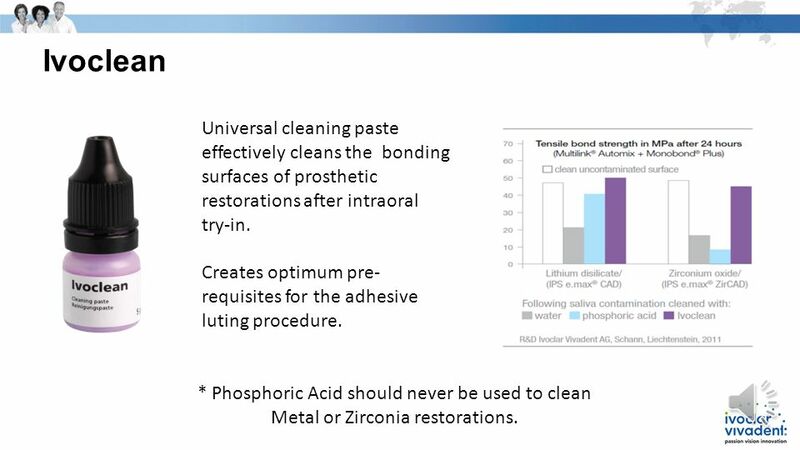 * Phosphoric Acid should never be used to clean Metal or Zirconia restorations. 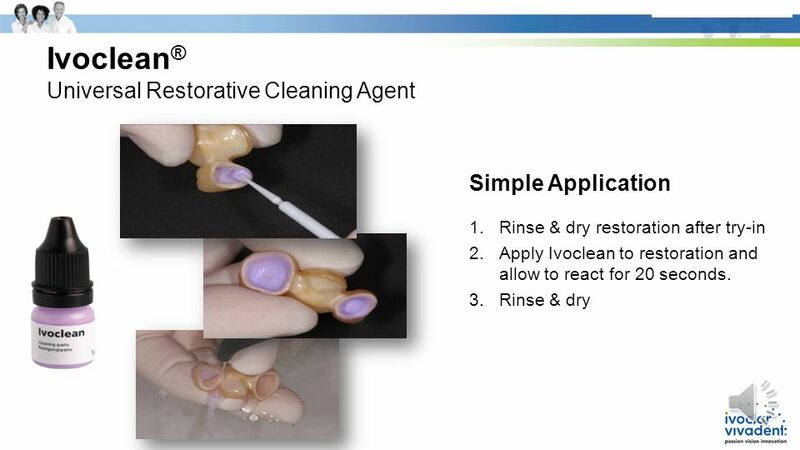 There are several different ways dentists can clean out a restoration after it’s been tried in the mouth ie water, phosphoric acid, alcohol, steam cleaner, ultrasound machine. They are all options but they yield different results. 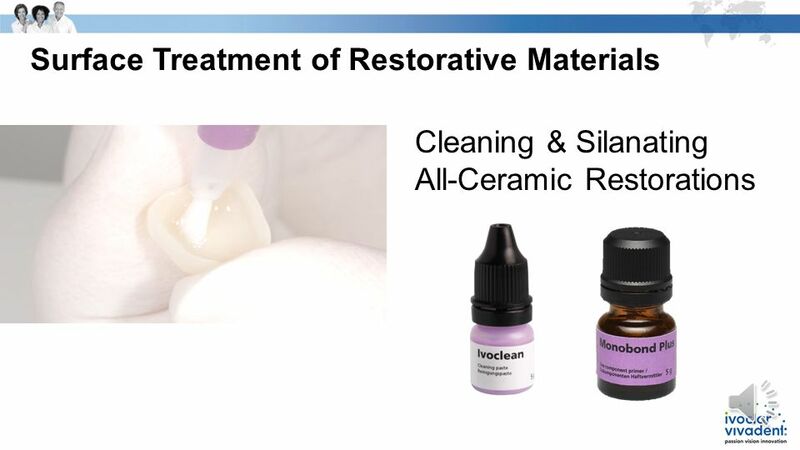 The most effective way to completely remove ALL of the contaminants off the surface of the restoration and prepare it for ADHESIVE or SELF-ADHESIVE cementation is to use Ivoclean. 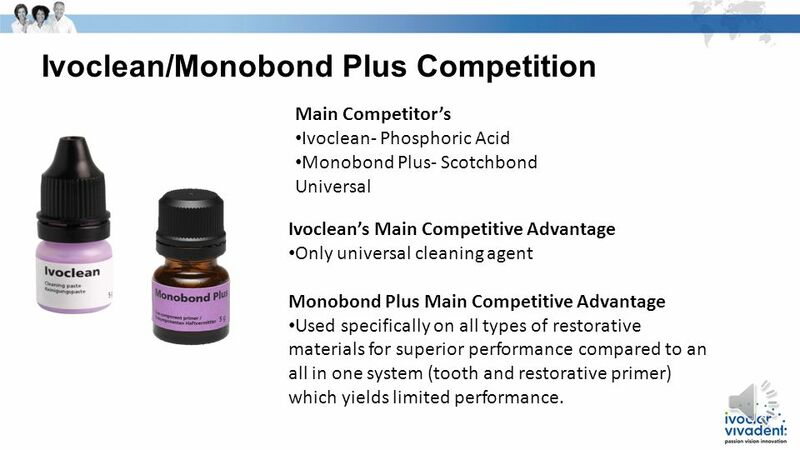 Main Competitor’s Ivoclean- Phosphoric Acid Monobond Plus- Scotchbond Universal Ivoclean’s Main Competitive Advantage Only universal cleaning agent Monobond Plus Main Competitive Advantage Used specifically on all types of restorative materials for superior performance compared to an all in one system (tooth and restorative primer) which yields limited performance. SpeedCEM maintains a consistent bond strength when stored properly (refrigeration) for the full 2 years of its shelf life even after you remove it from the clear plastic package. 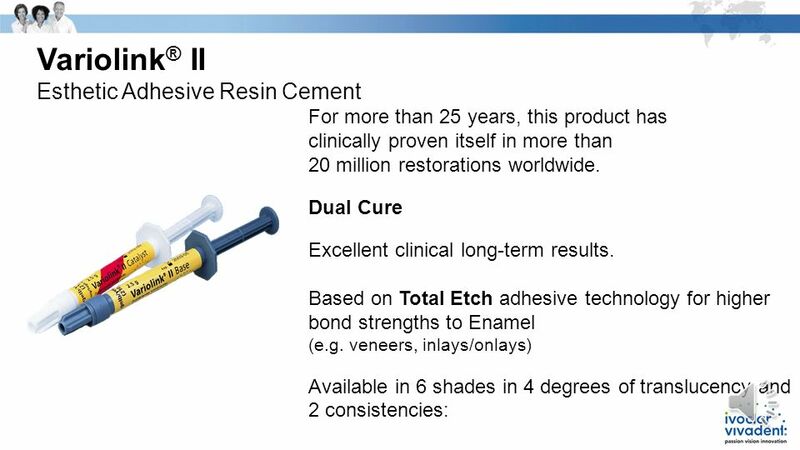 - Unicem 2- once taken out of the silver package, has a shelf life of only 6 months. This is stated in their own IFU’s: Storage and Stability Store RelyX Unicem 2 Automix in the pouch at 15°-25 °C/59°-77 °F. After removal from the pouch, use the product within 6 months and before the lapse of the expiration date. Constantly high humidity accelerates the setting and must be avoided. - This is a big deal especially at a university where they may open several syringes and let them sit there over time. 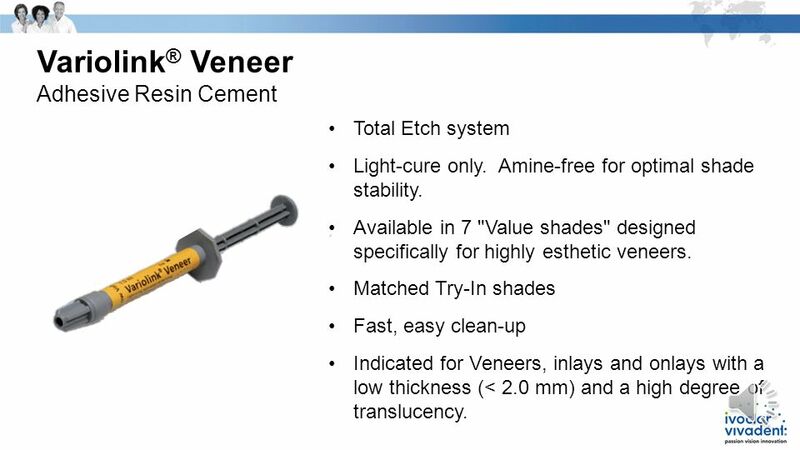 We have also found in our own applied testing center that when using an “older” syringe of Unicem 2 the bond strengths to drop. A freshly opened syringe is around 15 MPa but an older one is around 8-10. On the syringe there is a place to write down the date when you open the silver package- that’s saying something! Total Etch system Light-cure only. Amine-free for optimal shade stability. 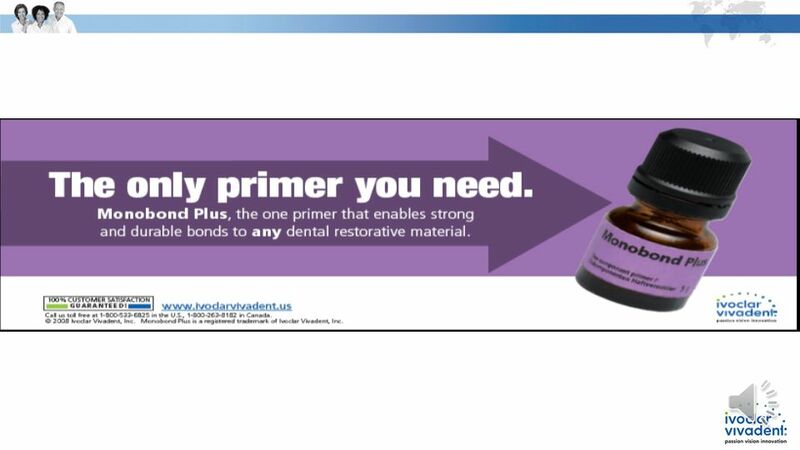 Available in 7 "Value shades" designed specifically for highly esthetic veneers. 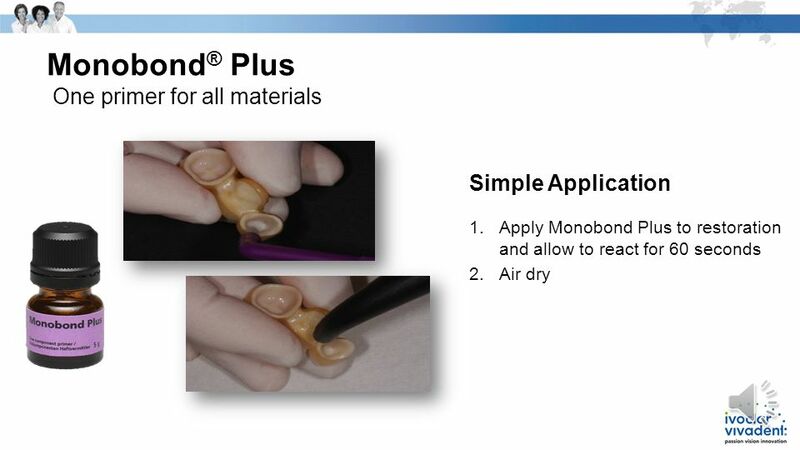 Matched Try-In shades Fast, easy clean-up Indicated for Veneers, inlays and onlays with a low thickness (< 2.0 mm) and a high degree of translucency. 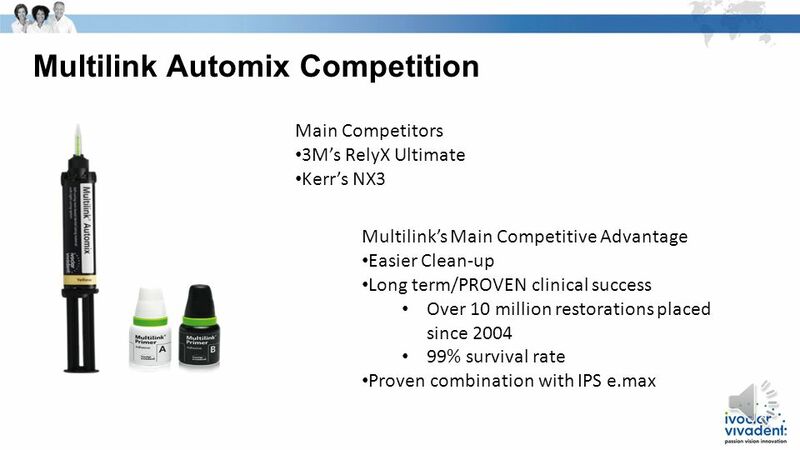 Main Competitors 3M’s RelyX Ultimate Kerr’s NX3 Multilink’s Main Competitive Advantage Easier Clean-up Long term/PROVEN clinical success Over 10 million restorations placed since 2004 99% survival rate Proven combination with IPS e.max SpeedCEM maintains a consistent bond strength when stored properly (refrigeration) for the full 2 years of its shelf life even after you remove it from the clear plastic package. 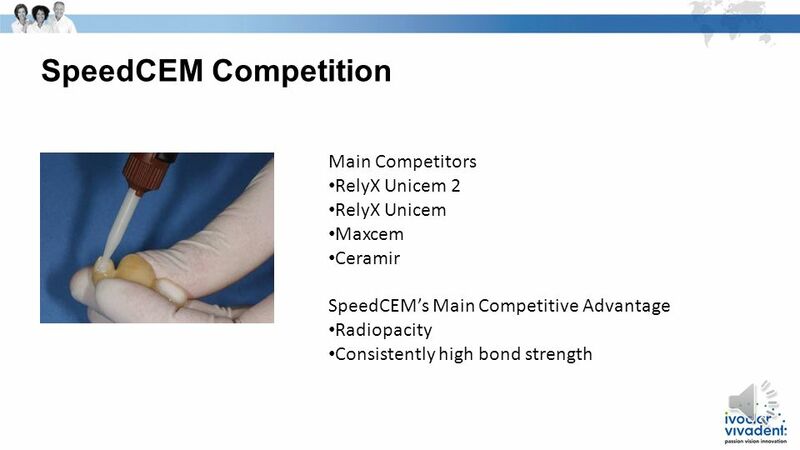 - Unicem 2- once taken out of the silver package, has a shelf life of only 6 months. This is stated in their own IFU’s: Storage and Stability Store RelyX Unicem 2 Automix in the pouch at 15°-25 °C/59°-77 °F. After removal from the pouch, use the product within 6 months and before the lapse of the expiration date. Constantly high humidity accelerates the setting and must be avoided. - This is a big deal especially at a university where they may open several syringes and let them sit there over time. 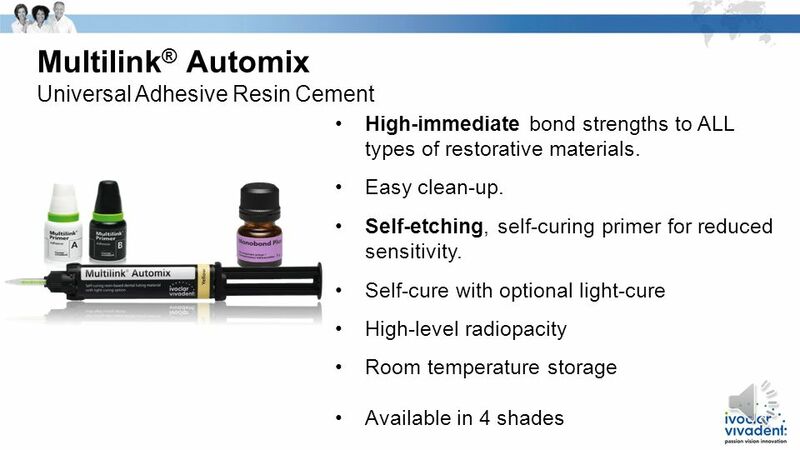 We have also found in our own applied testing center that when using an “older” syringe of Unicem 2 the bond strengths to drop. A freshly opened syringe is around 15 MPa but an older one is around 8-10. On the syringe there is a place to write down the date when you open the silver package- that’s saying something! 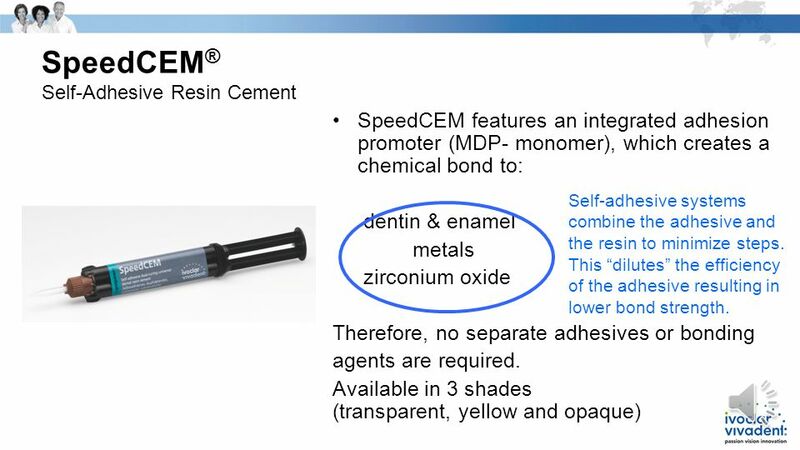 Maxcem Ceramir SpeedCEM’s Main Competitive Advantage Radiopacity Consistently high bond strength SpeedCEM maintains a consistent bond strength when stored properly (refrigeration) for the full 2 years of its shelf life even after you remove it from the clear plastic package. - Unicem 2- once taken out of the silver package, has a shelf life of only 6 months. This is stated in their own IFU’s: Storage and Stability Store RelyX Unicem 2 Automix in the pouch at 15°-25 °C/59°-77 °F. After removal from the pouch, use the product within 6 months and before the lapse of the expiration date. Constantly high humidity accelerates the setting and must be avoided. - This is a big deal especially at a university where they may open several syringes and let them sit there over time. 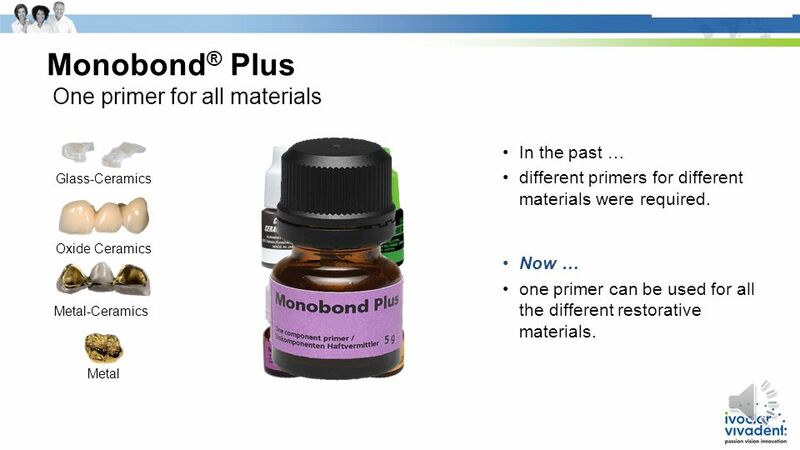 We have also found in our own applied testing center that when using an “older” syringe of Unicem 2 the bond strengths to drop. A freshly opened syringe is around 15 MPa but an older one is around 8-10. On the syringe there is a place to write down the date when you open the silver package- that’s saying something! 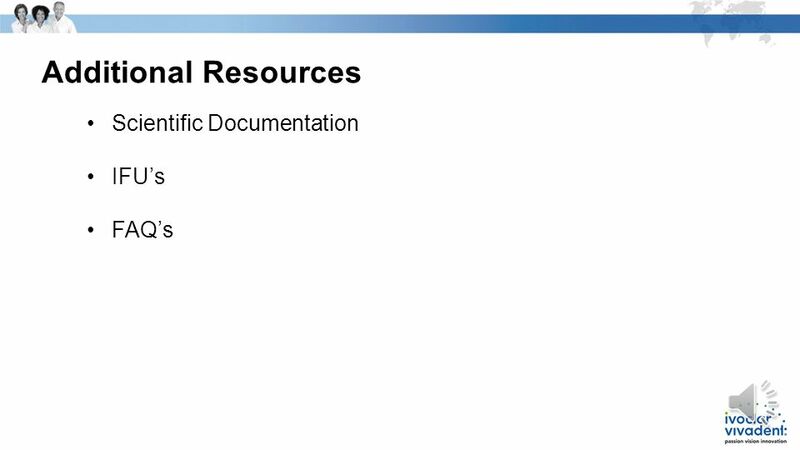 Download ppt "Cements Luting materials from Ivoclar Vivadent"
Classification of filling materials There are several classification of filling materials. Depending to which group the tooth belongs, filling materials. 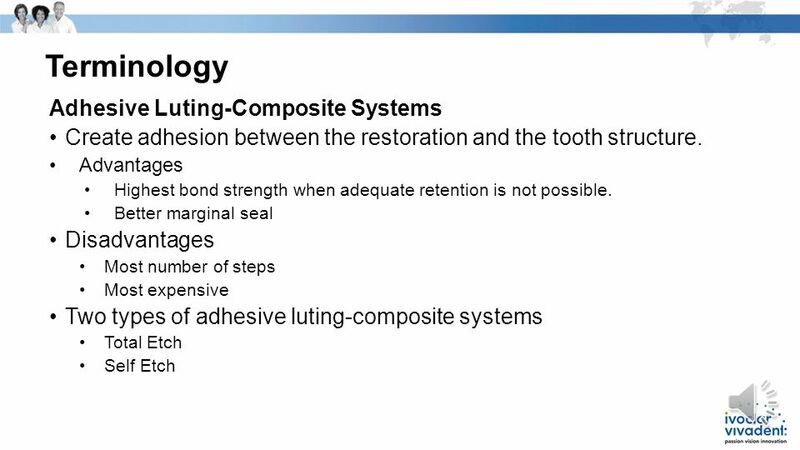 Dental Materials Restorations, Luting and Pulp Therapy Introduction. 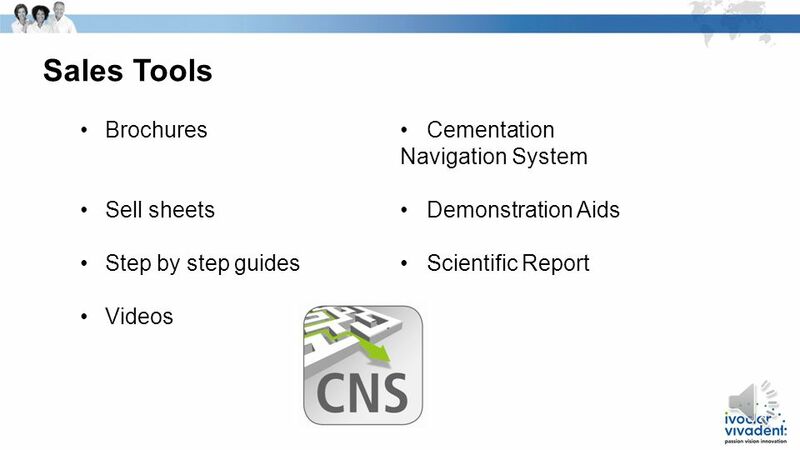 Restorative Materials in Pediatric Dentistry S.Lal, DDS Course Director. Indications, clinical and laboratory stages of manufacture of pin teeth. 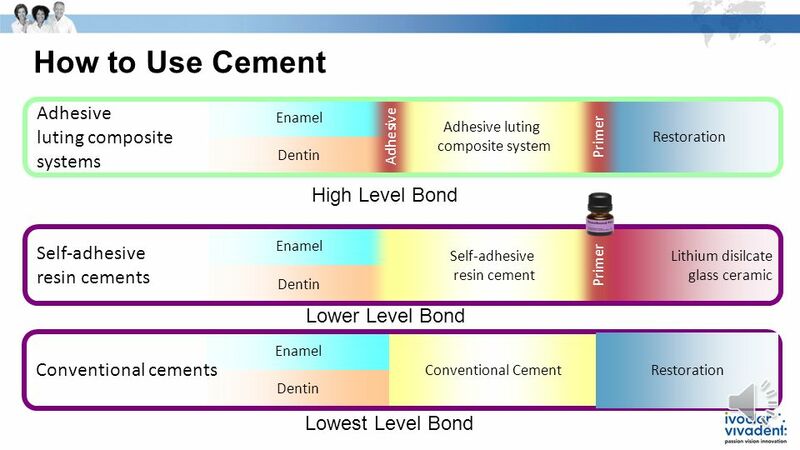 Bond Strength of SE Adhesives with Acid Etching A. Mszyca*, A. Kobashigawa, Kerr Corp, Orange, CA; J-L. Ruiz, Univ. of So. Calif., Los Angeles, CA 1805. 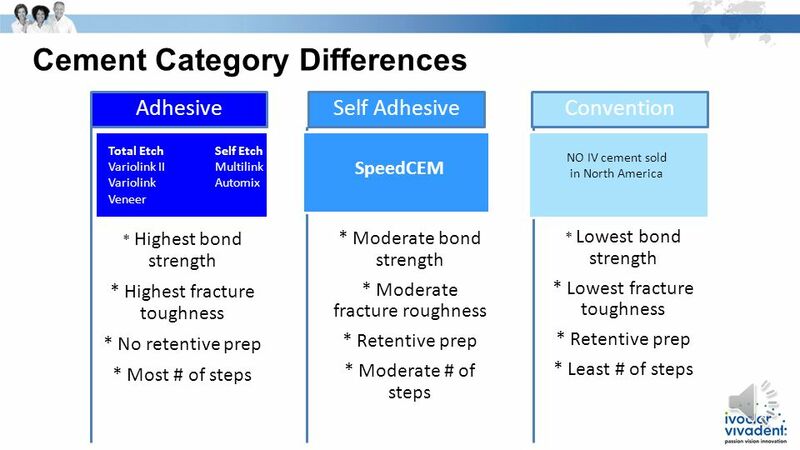 RESULTS Mean Shear Bond Strength, MPa (sd) Means with the same letter are not statistically different at p > 0.05 INTRODUCTION Self-adhesive resin cements. 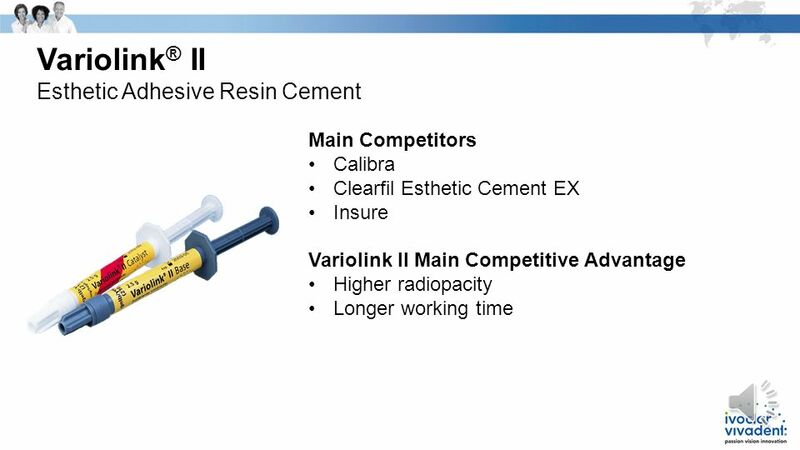 Calibra ® & Xeno ® IV Indirect; Crown/Onlay Material: Calibra with XENO IV and Self-Cure Activator Title: A Clinical Evaluation of an Adhesive for Bonding. 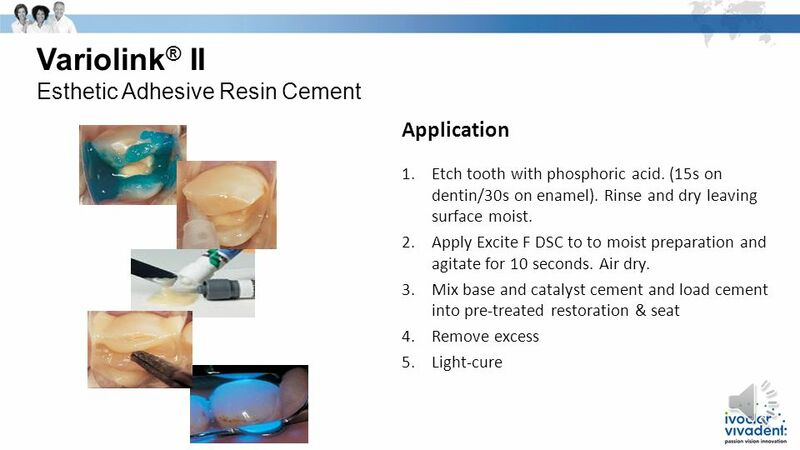 DA122 DENTAL MATERIALS Resin Cements. 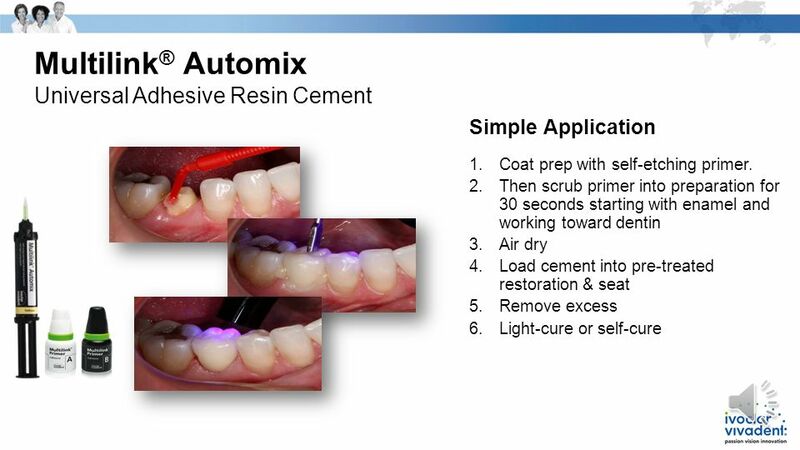 Common Uses for Resin Cements: Permanent cementation of:  Metal crowns  Bonding porcelain crowns + bridges (Maryland.